Safe, non-toxic disinfection for metal surfaces such as inner chamber of incubators and table top of the flow hoods. Each lot is MEA tested. Non-toxic, no alcohol, no odor. Easy to apply, no water dilution is required ( ready to use ). Sealed cap for extra security. Effective against hepatitis B, HIV, rotavirus within 1 minute, mycobacterium within 5 minutes and bacteria, fungi (candida) within 15 minutes. 3 years shelf life. It can be used till the expiry date after opening the bottle. Application : Apply evenly on the surface, wait 15 minutes to dry out fort he best result and clean with sterile sponge or cloth impregnated sterile water. 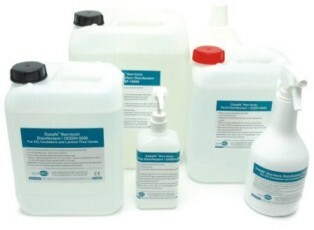 Safe, non-toxic disinfection for ivf laboratory surfaces and floor. 1:100 water dilution is required ( mix 10 ml Oosafe® disinfectant with 1 liter water ). Bactericide, fungicide ( candida ), algaecide and selevtively virucide. Neutralises bacteria which causes odour, good skin compatibility, does not stain. It dissolves dried blood stains and it does not contain any highly volatile toxic compound so it can also be used in closed laboratories which does not have enough ventilation. It is compatible with metal, rubber, plastic and wood. Application : Dilute Oosafe® surface disinfectant with 1:100 and prepare your cleaning agent for laboratory, wait 60 minutes after application and let the floor dry out. Safe, non-toxic disinfection for hands. Ready to use water based solution, perfect alternative to alcohol. Effective against hepatitis B, HIV, rota-viruses, TBb within 5 minutes and effective against salmonella within 30 seconds. Neutralises bacteria which causes bad smell, does not dry the skin, good compatible with skin. Suitable for frequent use, does not stain, it has a neutral smell.